Please remember to keep an eye out for your neighbours during cold snaps, particularly if they are elderly or vulnerable. Isolation is particularly dangerous when temperatures plummet. 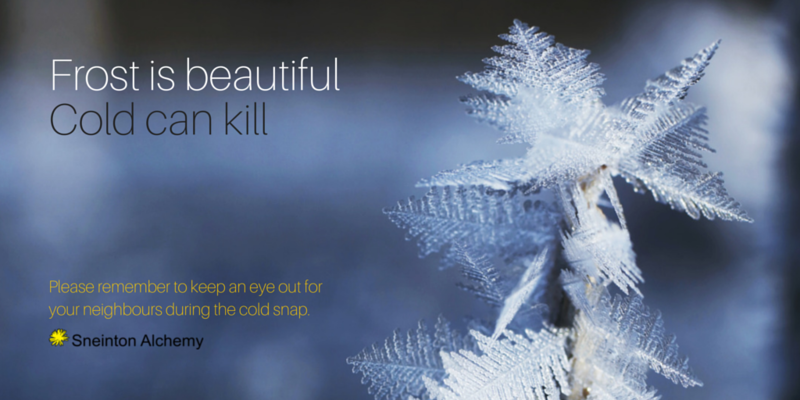 In the UK, in the winter of 2012-13 there were 31,000 deaths linked to the cold weather. Currently, there are 2.46 million households in England in fuel poverty. This is when a household is living below the poverty line and has higher than average energy bills. This makes it hard to afford to keep the house at a high enough temperature, but there are other things you can do to stay warm, such as eating a hot meal, layering on the clothes and keeping active. Friends and neighbours have a vital role to play. Remember to check on older neighbours or relatives to make sure they're safe and well. Make sure they're warm enough, especially at night, and have stocks of food and medicines so they don't need to go out during very cold weather. If you're worried about a relative or an elderly neighbour, contact the City Council or ring the Age UK helpline on 0800 00 99 66. For further advice on dealing with the cold- check out the NHS website.